Cornerstone Apartments is ideally located in beautiful West Valley, with easy access to the freeway, public transportation and shopping. Your new home features washer and dryer hookups in each apartment, extra storage space, and spacious living and dining areas. Our playground and community rooms are a great place to gather with friends and neighbors. Enjoy our sparkling pools and updated fitness center. 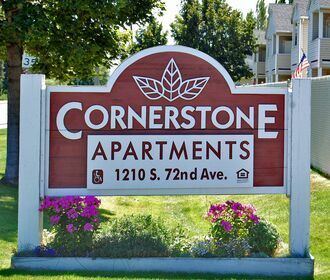 Cornerstone Apartments has the comfort & convenience you have been searching for! We do not accept Comprehensive Reusable Tenant Screening Reports as defined by and pursuant to RCW 59.18.